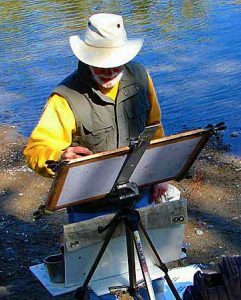 Internationally recognized artist Woody Hansen, has had a close relationship with watercolor painting for over sixty years. He is the recipient of numerous awards; including the Gold Medal at the 1974 California State Fair, and the prestigious Bank of America award at the DeYoung Museum, San Francisco. He has taught watercolor classes and workshops, juried art exhibitions and demonstrated his watercolor technique for many organizations. His work is in private and corporate collections nationally, and internationally as well. Hansen combines outdoor work, with the more controlled studio environment . Over the years his subject matter is varied. However, raised in the city of Mount Shasta, and now living within a few miles of Sacramento’s American River Parkway, Hansen prefers the outdoors; even much of his non-objective work originates, whenever possible among rocks, trees, sand, and water. His formal education is in art, including the University of California college of Environmental Design (Architecture), Berkeley, and California College of Arts and Crafts (CCA), Oakland, where he studied watercolor painting with George Post, and Louis Miljarak. He has also benefitted from the friendship and workshops of other ;professional artists. Hansen’s early professional art career began when he started painting window signs at thirteen years of age. By the time he was in high school, he started a commercial sign business. Concurrently, he initiated a broadcasting career at the local radio station, KWSD, as a weekend announcer/disc jockey and the host of a Top Ten show. After college he became employed at KKIS in Pittsburg, California, as a radio personality, and eventually the station’s program director until being drafted into the Army. Following basic training he was assigned to Ft. Lewis, Washington. It was there that at the request of the company commander, he successfully completed a variety of art projects. Hansen also served as a broadcaster for the Ft. Lewis Public Information Office. During off duty hours, he landed employment at KMO radio, Tacoma, as an evening disc jockey until finishing his military service with a thirteen month tour of duty in Korea. Soon after discharge from the army, Hansen found work at KSRO, in art friendly Santa rosa, California, where he eventually became that station’s Program Director. Five years later he accepted a similar position with KCRA, in Sacramento. All this time, Hansen’s interest and practice of art never waned. He was continually exhibiting and selling his work since his release from the Army.